One of the most frequent questions I receive is "Do I need to rent a car on Oahu?" The answer is no, but you may want to for at least part of your visit since it will make it much easier for you to get to some of the beautiful outlying areas of the island. Let's look at this question and answer in a little more detail. Of the 4.5 million folks who visit Oahu every year, about 98% arrive by commercial airlines at Honolulu International Airport. The airport is located northwest of the city of Honolulu and about 10 miles from the popular tourist destination of Waikiki. Visitors who will be staying in Waikiki have numerous options to chose from in getting to their hotel or resort. You can, of course, rent a car. Most of the major car rental companies have locations right at the airport, including Alamo, Avis, Budget, Dollar, Enterprise, Hertz, National, and Thrifty. We have a feature on Renting a Car in Hawaii that will help you should that be your choice. When you pick up your car, be sure to get a copy of the free driving guide that each company offers. These guides include detailed maps of Oahu that will be a great help as your drive around the island. Keep in mind when renting a car that most Oahu hotels and resorts charge up to $35 a day for parking. With some that included valet parking where you should really tip the valet when he or she retrieves your car. Those are all costs that you should consider when you budget your car rental expense. 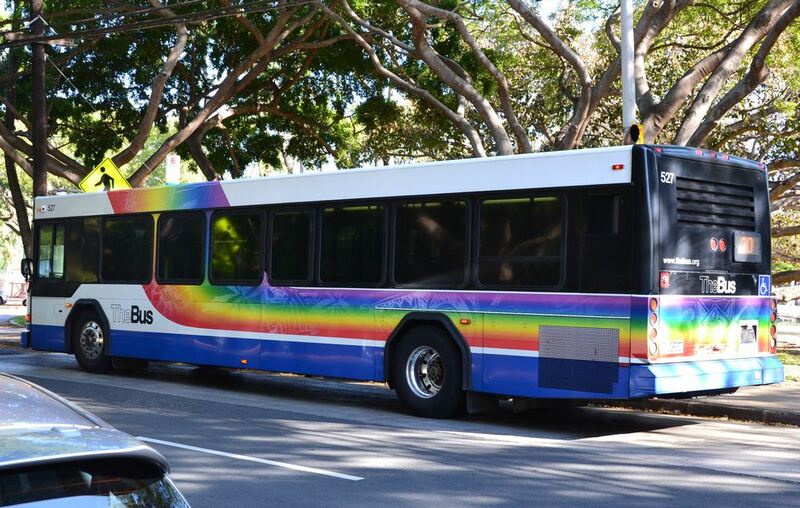 If your luggage is small and manageable, you can take Oahu's public transportation, appropriately called, TheBus, which makes numerous stops throughout Honolulu and Waikiki. There are also a number of hotel shuttles, tour company shuttles, and island taxis that make pickups at the airport. Check with your hotel or resort in advance to see if they operate a shuttle service. Taxi companies recommended by the Oahu Visitors Bureau include Charley’s Taxi & Tours (808) 531-1333, Pacific Taxi & Limousine Service (808) 922-4545 and TheCab (808) 422-2222. If you are staying at a hotel or resort outside of Honolulu and Waikiki, such as the Ko Olina Resort which includes the JW Marriott Ihilani Resort & Spa, Marriott's Ko Olina Beach Club, and the Disney Aulani Resort or at the Turtle Bay Resort on the North Shore, I would recommend that you rent a car. Assuming, for the moment, that you are staying in Waikiki and have decided not to rent a car at the airport. Many, if not most, hotels and resorts have activities desks or even car rental company desks right at the resort where you can rent a car for a day or two. For visitors who plan to spend most of their vacation in and around Honolulu and Waikiki, this is a great alternative. While there are many day tours that will take you to various places on the island, there are still many other places for which you really need a car to visit and explore at your leisure. You might want to check out our things to do on Oahu to help plan your itinerary. If most of your stay will be in Honolulu or Waikiki, in addition to TheBus, the Waikiki Trolley has three routes focusing on different areas of interest: scenic attractions, historic and cultural sites, and shopping and dining. You can buy a 1, 4 or 7-day pass and each allows unlimited boarding and re-boarding privileges for as long as your pass is valid. The cost is less than $20 a day for an adult - a real bargain and an easy way to see the sights around Honolulu and Waikiki. They also offer island tours through their sister company E Noa Tours. So, whether you decide to rent a car for all or part of your stay or take advantage of the many other options available, there are lots of ways to get around in Waikiki.